The Aurochs or Bos primigenius (Bos taurus past name), is an extinct bovid that once lived in Europe, Asia and North Africa during the final Ice Age. 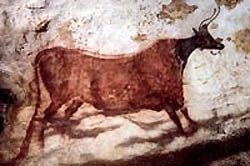 Aurochs are the ancestors of present-day domestic cattle. They lived on the plains and at the forest's edge. Their populations were gradually reduced as people hunted them and civilization destroyed their habitats. Surviving the great Pleistocene mass extinction, the last Aurochs known died on a game preserve in Poland in the year 1627 A.D.. The Aurochs was a famous animal in prehistoric times. These ancient cattle were armed with massive bones, heavily muscled bodies and long curving horns. They were hunted and worshipped by primitive humans, and featured in many famous prehistoric cave paintings across Europe. To challenge such a massive and powerful beast with mere wood and stone weaponry must have certainly been quite an experience and no doubt the killing of an aurochs with such primitive weapons would have brought great respect amongst human peers for bravery, if not for insanity!